Beau's Beer Hack members (above) manage to find their bench during their foggy season opener vs. the Gas Station Islanders. The rivals played to a dramatic 2-2 draw with GSI's goaltender pulled for the extra attacker. TORONTO - The opening night of the 2013/14 UUHA Regular Season turned into a foggy affair after a suspected technical failure at Upper Canada College's William B. Wilder Arena this past Saturday evening. 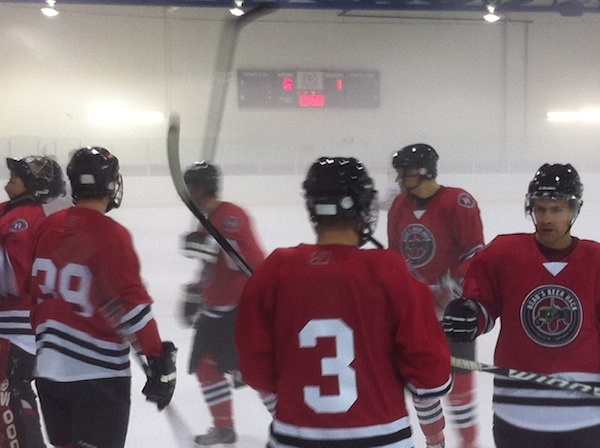 Conditions, which had been normal for the night's opening game between the Jokers and Humiliation, turned decidedly misty midway through the 2nd period of the 8:00 PM contest between the Brockton Rockets and the Parkdale Porcupines. By the 3rd frame it was difficult to see from one end of the ice to the other. A malfunctioning dehumidifier is suspected to be responsible for the memorable yet less-than-ideal conditions. Stats keeners didn't have to wait very long to find out who would be responsible for the first goal of the new UUHA season, as Jokers forward Gary Rideout Jr. solved Humiliation goalie Luke Smit just over a minute into the 1st period of the debut contest of the new campaign - a rematch between last year's Championship Final contenders. More firsts were to follow for the Funniest Team on Ice including the first penalty of the season (a Body Contact call on Jokers spare Derek Scott) and the first shutout of the season, registered by Jokers goalie Burke Lawrence. The Humiliation, meanwhile, claimed the first penalty-free game of the season, picking up a half point for their gentlemanly efforts in the process. The only other scoring in the 2-0 Jokers victory came from the stick of Tyler Stewart. Sean Cullen, Duncan Fremlin and Steve Levine were awarded assists on the evening. As if challenged to recreate the game that had just been played, the Parkdale Porcupines skated to a 2-0 victory over the Brockton Rockets, registering a goal early in the 1st and then again in the 3rd period in a stunning display of coincidental mimicry. Additionally, the losing side also went penalty-free suggesting there may be something to the age-old saying about nice guys finishing last. Pines rookie Adam Valaik converted a feed from Adam Thrasher for the first goal of the game, while Brian Bentley secured the win with an empty-net tally (assisted by Elias Vastis). Goaltender John Sutton (on loan from the Wheatfield Souldiers) was credited with the Porcs' shutout. Despite the loss, the Brockton side matched their opponents stride for stride, out-shooting the Porcs by a considerable margin of 20-13. Perhaps inspired by their brand new set of white Home sweaters, the Rockets used the occasion of their first official game as a full-time UUHA team to demonstrate a noticeable improvement over last season's exhibition play. By the time the Parkdale Lads and Wheatfield Souldiers took to the ice at 9:00 PM, it was evident the fog that had settled in during the late stages of the previous game would be a factor from the drop of the puck. (As several players commented during the warm-up skate, conditions were reminiscent of the legendary Fog Game between the Buffalo Sabres and Philadelphia Flyers on May 20, 1975. Thankfully, no bats appeared to be present at UCC on this occasion). Although no scoring transpired during the 1st period (which saw a combined total of just six shots on nets), by the 2nd frame both teams seemed to have adjusted to the conditions, foregoing long passes in favour of carrying the puck, and emphasizing getting shots on the net, ideally as hard and from as far out as possible. Lads sniper Kyle Welton got his side on the board first, potting a feed from Tom Nesbitt at the 8:20 mark of the period. Souldiers forward Jimmy Murphy responded exactly two minutes later, converting Joey Serlin's pass to knot things at 1-1. Mike Harkness then put Burton's Boys ahead by a goal less than a minute later, solving Lads goalie John Sutton (on loan from the opposing team) at the 5:35 mark. But the Lads countered almost immediately, bulging the twine behind Souldiers tender Sheldon Shurland twice within a 45 second span. That barrage (compliments of Mike Ryan and Welton) put the Lads up by one, before newly-returned veteran Lad Ryan Kalinka increased the lead by another goal prior to period's end. Welton would complete the first hat-trick of the new season in the final minute of the 3rd frame. Defenceman Nick Hehn collected three assists on the night (good for the game's 2nd Star honours) while teammates Simon Evers, Ron Sherkin and Mike Frolick were also credited with helpers. Souldiers defenceman Keven Magura and forward Kelly McCaig registered assist for the Winnipeg side. Given the on-ice conditions, veteran players of both the Gas Station Islanders and the Beau's Beer Hack (newly sponsored and rechristened after years as the Chart Attack Hack, then later simply the Hack) could be forgiven for having foggy memories when it came to recalling the teams' first-ever meeting a full decade ago. Regardless, the fact the two old foes were facing of against one another to kick off the Hack's 10th year together as a team - and at 10:00 PM, no less - was no mere coincidence. In fact, had Hack forward Blake McDonald held off for a minute and 35 seconds, he could have opened the game's scoring at precisely the 10:00 minute mark of the 1st period (the goal, for those playing along at home, was scored at the 11:35 mark instead). GSI's Cam Collyer responded seven minutes later to knot proceedings at 1-1, before Hack threat Louis Durand recaptured the lead midway through the 2nd. But with just 39 seconds remaining in the game, and with veteran Isles' goaltender Sean Markle pulled for the extra attacker, occasional GSI forward Rob Yoshida emerged from the pea soup-like haze to solve Hack goalie Aaron Brophy and erase the differential. The final seconds solved nothing as the two teams shook hands as equals on the night. Hackers Stefan Barkley, Dave Laverdiere, Aaron Foster and Wade Ivan collected assist on the night, as did Gassers Collyer and Nick Purdon (2). Markle, incidentally, made his first appearance in the GSI net since undergoing surgery to repair an injury incurred during the 2011/12 UUHA season. UUHA action resumes next Saturday, Sept. 14 when the league returns to the hallowed environs of Maple Leaf Gardens for a special one-off 12:00 Noon contest between the Parkdale Lads and Brockton Rockets. Later that evening the Dufferin Groove will make their season debut vs. the Wheatfield Souldiers at 7:00 PM at (a hopefully less foggy) Upper Canada College, while the Jokers and Gas Station Islanders get reacquainted there at 8:00 PM. The Humiliation and Beau's Beer Hack will renew friendly hostilities in the evening's final game at 9:00 PM.